Many residential buildings are built with more parking than their residents need, and even more parking goes unused during daytime hours when residents are away. So it was encouraging to see a recent announcement from GarageHop. 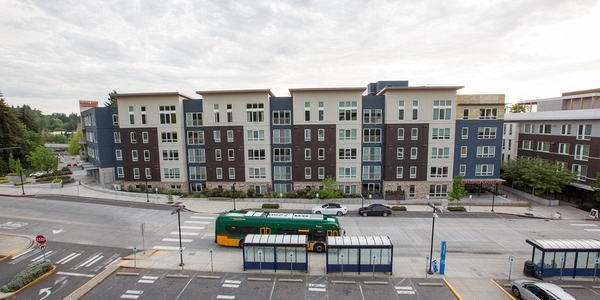 GarageHop is providing 40 spaces for commuter use in an apartment building at the South Kirkland Park & Ride. GarageHop is a Seattle company that provides monthly parking spaces in apartment buildings, typically leasing spots in buildings with over-provided parking to commuters and residents of buildings without their own parking. This is their first foray into suburban transit parking. Kirkland Crossing is a market-rate apartment building in South Kirkland, created as part of an award-winning TOD effort that opened in 2015. It was, somewhat ironically, built with excess parking. GarageHop puts these spaces to use by offering guaranteed parking for $80 per month. Customers sign up online and access the secured garage using their smartphone to park in their own reserved parking space. Parking at the Metro lot across the street is free. However the lot fills daily (averaging 97% utilization in fourth quarter 2017). At busy times, there have been issues with spillover parking to neighboring businesses. The only guaranteed parking at the Metro lot is via a pilot program for carpools and those spots are only guaranteed until 830am. GarageHop doesn’t require a carpool and can be accessed at any time. GarageHop joins Diamond Parking Service in the market for privately provided transit parking. Diamond developed a similar offer in partnership with Metro last year. Market rates for parking, even with guaranteed access, aren’t high enough to attract developers to build structured parking for transit in the suburbs. But GarageHop’s offer is welcome. They are efficiently reusing parking stalls that exist anyway, and offering an additional option for transit users to access the system. The fact that market rates can’t cover the costs of parking even in high demand areas shows how wasteful it is to spend transit dollars on parking lots. (Though I understand their political necessity). Market rates don’t cover the cost of building roads or most transit infrastructure, either. Transportation infrastructure is a public good, so the “market rate” argument is irrelevant. I notice that some of the park and ride lots in the linked Metro report are reported as more than 100% full (e.g. Green Lake P&R, which is 104%). How can that be? Maybe that’s one person parking in the morning and another in the afternoon, or daytime and evening. People parked illegally. 100 full spaces, plus 4 people parked illegally = 104%. Don’t they ticket and tow people who park illegally? Cars parked on the median or in the drive lanes can push utilization over 100%. It is great that parking is becoming something that is moving towards market-rate and away from being implicitly subsidized by businesses, government, building regulations etc. The growing pains won’t be unnoticeable, but it is a move in the right direction. The reason why I use transit to get to work despite it doubling to tripling my commute time is that parking is expensive. If I’m paying $80 to park to take the bus, why bother taking transit at all? Apparently some people will do it – evidently people for whom it won’t triple their commute. If I’m parking and then taking a bus straight in an HOV lane into downtown, that’s a lot faster than driving as an SOV. Plus, $80/month is cheaper than daily 520 bridge tolls. It doesn’t matter whose’s doing it, but they wouldn’t make money offering the option if people weren’t willing to pay it. Although, personally, I think there’s enough free hide-and-ride spaces further up the 255 route that, it’s easier to just park there. I’m also surprised that Medina doesn’t have a lot of hide-and-riders parking on their streets to ride the 271. I guess they figure they’re wealthy enough that no one would dare. So you can read a book or watch the scenery or meditate instead of driving in traffic? The only people who would park there are those going to Seattle, and that means crossing the bridge and going through the I-5 mess and Stewart Street slowness. It was probably built that way because city code required it. A perfect example of parking requirements gone amuck. Every person who lives in that building is paying for the unused parking spaces in their rents. They did get a reduced parking requirement vs what applies elsewhere in the city, but still far too conservative. Appear to have started with a ‘worst case’ from TOD elsewhere, then worked upwards from there. Here’s a copy of the Kirkland’s parking requirements. It’s pretty awful, but apparently, it used to be even worse. As you can see in the map, the South Kirkland TOD property was given a special reduction, so it only needed 1.1 parking spaces per unit. I guess the city decided that proximity to transit means each person only needs one car, rather than multiple cars. Elsewhere in the city, it ranges from 1 space per bedroom to 2 spaces per unit. It was, somewhat ironically, built with excess parking. Funny, immediately after the complex opened residents started using the P&R spaces. It wasn’t hard to pick out the resident cars and their owners. Why would they park outside when they have all that excess parking? Could it be that there is actually a charge on top of the rent to park? Each unit only gets one space? Just curious why they would take P&R spaces if there is actual excess in their building. It’s a bit misleading to say that the Kirkland Crossing is all market-rate apartments. Yes, they only have 3 affordable units (at the 61-80% affordability level) out of 185 units. But the Velocity apartments, which were built at the same time on the same park & ride, have 58 affordable units. The majority (44) are at the 40% or less level, and remaining 14 are at the 51-60% level. While the Velocity was built by Imagine Housing and the Kirkland Crossing is market-rate, I don’t think many people know the distinction. It’s one complex. Ironically, the affordable housing has the better views! So I’d say that the South Kirkland P&R has 243 apartments, 61 of which are subsidized. Yes, it’s technically two complexes. But you’re really looking at a community with 1/4 affordable housing.